The final stage of the LPGA Tour Qualifying Tournament (a k a Q-School) got is under way. The first round leaders are Jane Park (above) at 7-under and Kelli Kuehne (below) at 5-under. We introduced you to Kim Kouwanbunpat just a few weeks ago, but it's never too early for another Kim pic! Bonus pic: Below, also from the West Coast Golfer article, is Kim with her good friend Nisha Sadeker, with whom she works at Play Golf Designs. Elin Nordegren is married to ... um ... what's his name? Tiger something. She's already won that sweepstakes. Now she's been nominated for inclusion on AskMen.com's "Top 99 Most Desirable Women of 2008" rankings. And you can cast as many votes as you want for Elin (you know Tiger's sitting in front of his computer right now clicking away - he doesn't like to lose at anything!). Go to askmen.com/specials/2008_top_99/index_vote.html and find Elin in the Models section. Then rate her from 1 to 10 (10 being the "most desirable," natch). You can vote as many times as you like. The final results will be revealed on AskMen.com on Jan. 31, 2008. Jodi Ewart is a sophomore on the University of New Mexico women's golf team. Jodi's freshman season (2006-07) was one of the best in school history. She set a school record for scoring average; won the Mountain West Conference championship tournament and had six other Top 10 finishes; was named conference Freshman of the Year; MWC co-Player of the Year; and was named to All-America teams by the National Golf Coaches Association of America and by Golfweek magazine. A psychology major, Jodi is from England and has won plenty of big amateur tournaments in the UK. Among those titles are wins at the Girls Home Internationals (twice); the Ladies Home Internationals and the England Northern Ladies Championship; and her biggest win to date, the 2007 English Women's Strokeplay Championship. While Jodi continues her career at New Mexico as one of the top collegiate golfers in America, expect to see more of her in international competition, too. She should be a lock for the Great Britain & Ireland team in the Curtis Cup at St. Andrews in 2008. Marie-Josee Rouleau is a native of Montreal who won numerous amateur tournaments in Canada (including the 1992 Canadian Ladies Amateur Championship) before turning pro in 1994. Since then Rouleau has been a member of both the LPGA Tour and Ladies European Tour, while also playing on the Futures Tour and CN Canadian Women's Tour. Along the way, Marie-Josee won Rookie of the Year honors on the LET in 1997, led the Canadian Women's Tour in earnings two seasons, and posted six wins on the Canadian Women's Tour. The photo to the left is the mugshot used by the Futures Tour and LET on each tour's profile page for Rouleau. Below is a photo from a recent shoot Rouleau did for Play Golf Designs. As regular readers of Golf Babes know, Play Golf Designs is a Las Vegas-based golf event management company whose roster of professional golfers includes many, well, golf babes. 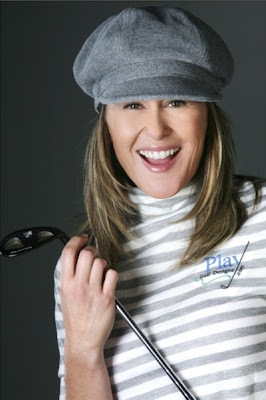 You can learn more about Play Golf Designs (and how you can play golf with Marie-Josee, or schedule her to play in your corporate outing) by visiting the PGD Web site, or by clicking here to see other PGD pros on Golf Babes. Many of her friends call her "MJ"
And MJ loves to dance. She'll be taking salsa classes soon, saying, "Salsa helps me discover a new me, moving my lower body which in golf you are a lot more static!" Here's the lovely and talented Anna Rawson on the red carpet prior to the 2007 ESPYs in Hollywood. This is a big time for Anna. She played on the Ladies European Tour in 2007, but is chasing her LPGA Tour card for 2008. Anna will be playing the final-stage LPGA qualifier beginning Nov. 28, and we certainly wish her many birdies. Our friends over at oobgolf recently conducted an interview with Ms. Rawson. You can read it here. Hawaii native Bridget Dwyer was a contestant on "The Big Break VI: Trump National." She's been playing the Futures Tour the last couple years - more on her background here. But Paula's 2008 calendar is now for sale. The calendar is done for Golf Digest Japan and is only for sale through GDJ's Web site (although we have spotted it on eBay once or twice, too). Not being able to read Japanese, I can't determine whether the calendar can even be purchased by anyone outside of Japan. But if you want to try, the Golf Digest Japan Paula Creamer 2008 Calendar page is here. Perry Swenson graduated from the University of Texas with a degree in finance, turned pro and has played the Futures Tour for the past couple seasons. Her best finish to date is a tie for fourth. Momoko Ueda is a player to watch, and we might just get to see more of her next year after she won the LPGA Mizuno Classic. Ueda is a member of the Japan LPGA. She's just 21 years old, but now that she's won an LPGA tournament, she gains fully exempt status on the U.S. tour for 2008. Back by popular demand, it's Sydnee Michaels. Sydnee grew up on the golf courses and beaches of Southern California, so it's no surprise she's at home in a place like Hawaii. Michaels, a sophomore on the UCLA women's golf team, was in the islands with the team to take part in the Kent Youel Invitational tournament, hosted by the University of Hawaii. UCLA won the tournament, and Sydnee finished 10th in the individual standings.